Salamanders beware – a new threat to your health could be coming to the United States. Batrachochytrium salamandrivorans — Bsal for short – is a fungus that eats away the skin of certain salamanders. It’s found in parts of Asia and Europe, and researchers say it could strike the United States next. 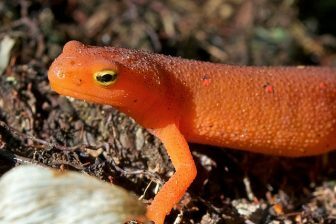 Lab tests show that the Eastern newt is highly susceptible to the fungus, said Katherine Richgels, a researcher at the U.S. Geological Survey’s National Wildlife Health Center in Madison, Wisconsin. It causes the salamanders to get lesions and sores on their skin, said Richgels, who recently did a study of the disease. Every eastern newt that researchers exposed to it died. And it acts fast. Salamanders that contract the fungus often die within six or seven days, Richgels said. Eastern newts in the region have an increased risk because Chicago is a port where diseased salamanders could be brought in, said Evan Grant, another author of the study. Lower Michigan also has high numbers of pet stores, raising the likelihood of introduction. The pathogen was discovered in 2013, when fire-bellied salamanders in the Netherlands started disappearing at an alarming rate, Richgels said. The fungus caused the species to collapse. A similar collapse of salamanders in the U.S. could have far-reaching consequences, especially affecting their predators and prey, said Grant, a researcher with the US Geological Survey Patuxent Wildlife Research Center. And Eastern newts are important. They regulate the number of frog tadpoles and “affect the amount and type of nutrients available in the ponds.” A decline of newts could create an ecological imbalance, according to the U.S. Fish and Wildlife Service. There are no successful treatments for wild salamanders with the fungus. Only salamanders kept as pets that get sick could potentially be treated, Richgels said. “Preventing is going to be much better than trying to mitigate once it gets here,” she said. As a precaution, the Fish and Wildlife Service banned 201 salamander species from importation in January, said Michael Adams, an ecologist at the Geological Survey’s Forest and Rangeland Ecosystem Science Center. That will also prevent moving them around within the United States and hopefully slow the spread of Bsal, he said. The ban may stop hobbyists from collecting certain species, said Jyzun Boget, the assistant manager of the reptile department at Preuss Pets in Lansing, Michigan. The salamanders are now harder to find and their prices have skyrocketed, he said. But that is an incentive for people who already own them to start captive breeding. If they’re successful, prices will come down and the salamanders will be easier to get. “The end of this particular story has a happy ending,” Boget said. Instead of being captured from the wild, the salamanders will be captive bred, meaning there is less impact on the environment and they will live healthier lives. But banning those species from import is only one step that needs to be taken, Grant said. The Geological Survey is working on prevention methods and collecting samples to determine if Bsal has already reached the U.S. There are “lots of other groups that are doing things like susceptibility trials, where they’re collecting salamanders and amphibians and exposing them to the pathogen to see if they get sick,” Richgels said. Seven salamander species have been tested so far, including the eastern newt. But there are 191 species in the U.S. More of those may be vulnerable. “It’s a fairly unprecedented level of organization and effort going on for something that we don’t know to be here,” Adams said. His agency and others are planning what to do in the event of an introduction. The public can help prevent its spread, Richgels said. People who keep amphibians as pets shouldn’t release them into the wild, Richgels said. Owners should use a 10 percent bleach solution to decontaminate any dead salamanders or water or other materials they have touched before discarding them, she said. Those who enjoy exploring nature can help by looking out for dead salamanders, she said. Immediately report a large number of dead salamanders to an environmental agency for further investigation.